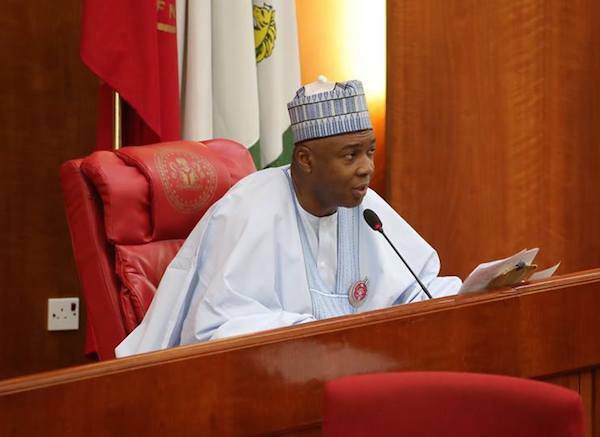 The audacity of protest by the Parliamentary Staff Association of Nigeria, PASAN, in the National Assembly on Tuesday forced the Senate President, Dr Bukola Saraki to address protesters after about six hours. The protest, which began at exactly 8am Tuesday by the National Assembly staff over the non payment of allowances, successfully stopped Tuesdayâ€™s sitting as lawmakers of the upper and lower chambers were turned back. Immediately the Senate President appeared for his address, the noise became tumultuous with chants of â€œno alert, no sittingâ€. Saraki, in his address, said he and the Speaker of the House of Representatives, Yakubu Dogara, have accepted responsibility for the non payment of allowances and those issues that formed the grievances of the staffers. He also promised that they would find money anywhere to pay the protesting parliamentary staff, noting that it was their entitlements. â€œAs the President of the Senate and the Speaker of the House of Representatives, we accept responsibility for the non payment of part of your allowances. â€œWe will find money anywhere to pay you, but you should give us time to do that. â€œPlease give us time between now and Friday this week so that the leadership could sit with the NASS management over this issue,â€ he said. Infuriated by what Saraki said, the protesters insisted that the upper and lower chambers would not be opened for sitting until they all got alert confirming payment. Meanwhile, a female protester, who spoke with DAILY POST under the condition of anonymity, explained that the National Assembly management was in receipt of huge sums of money under the sub-heading that has to do with their allowances last week Thursday, stressing that it was on this basis that the protest would continue until they are paid. She said, â€œWe know what we are doing here. The issue of Friday appointment with the management will not be accepted. We have been hearing this for a long time. Let them pay us now. â€œJust last week Thursday, the money we are talking was released by the Federal Ministry of Finance and we will not wait for it to be shared by the management as usual,â€ she insisted.